“When I arrived in China a few years ago I knew I was in for some culinary heavy-hitters; the crispy, supreme Peking Duck in Beijing, the delicate dumplings in Xi’an with a symphony of equally impressive fillings, and the modern fusion cuisine in Shanghai’s diverse gastronomic neighborhoods – what I wasn’t expecting, however, was a jar filled with what was basically serpents and moonshine. It means much more than that, however, to locals all over China and many other Southeast Asian countries. 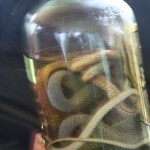 Snake wine is a tonic that is believed to possess medicinal qualities, and the wine is often advertised to cure anything from farsightedness, to hair loss, to sexual performance. Snake wine is produced when a large venomous snake is placed into a glass jar of rice wine often with many smaller snakes, turtles, insects, or birds, and left to ferment for many months. Have no fear, the venom is rendered ineffective by the ethanol in either the wine used to make this concoction; its proteins are degraded and therefore deactivated. Some say that the unexpected are foreboding in travel – a delayed flight, a rain storm, a traffic jam – but it is moments like when our local Chinese guide pulled out the jar of snake wine, the look on his face very knowing that he was about to surprise a well-traveled visitor, that make me feel the opposite. Travelers have to cherish the unexpected; even when it means your cocktails come with a scaly garnish. Care to try some yourself? Here’s the perfect opportunity, China: Rediscovering an Ancient Empire, April 19-30. E-mail is the best way for us to let you know first about new trips, travel tips, special events, and current promotions. 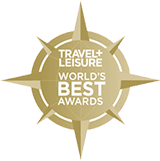 Sign up for our e-newsletter, e-mail your name and address to info@www.boundlessjourneys.com, or give us a call (800-941-8010), and we’ll keep you in the loop! We respect your privacy and will never sell or share your e-mail address with any third party company, and our unsubscribing process is easy and prompt.